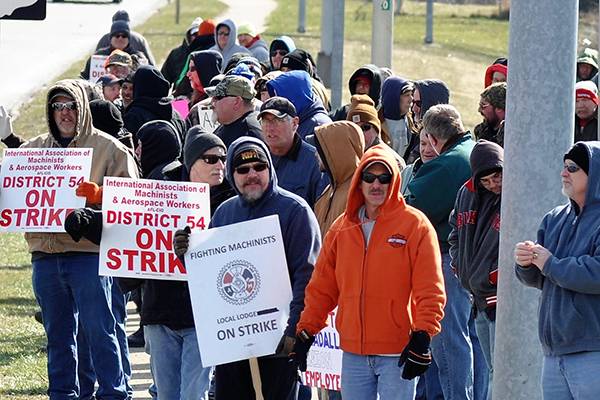 The nearly 200 IAM Local 1285 members at Gradall Industries in New Philadelphia, Ohio, who remain on the picket line 15 days after striking the excavator manufacturer, won a big court battle over their rights to a quality picket line. When members went on strike and set up pickets on March 12, Gradall filed a Temporary Restraining Order (TRO) that severely restricted the Local’s ability to set up and maintain useful picket lines at the manufacturing facility. The TRO sought to limit the number of picket locations to one and amount of picketers to three. This followed action taken by the Sheriff’s Department of closing two major streets in front of the plant for so-called “safety” concerns. On March 14, dozens of members, families and supporters braved high winds and chilling temperatures to flood the public sidewalk adjacent to the major U.S. Route, which runs through the city and alongside the plant. Members were greeted by horns in support including a school busload of kids waving and cheering on their way home. “The support was tremendous, and was a real shot in the arm to the members,” said Wright. 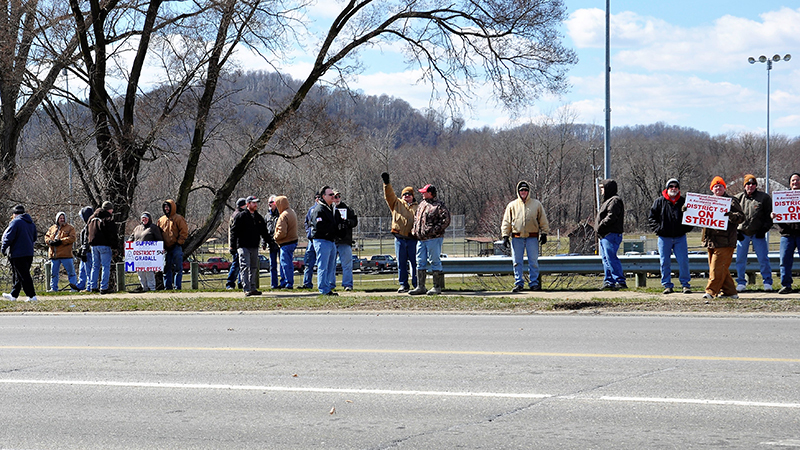 On March 22, IAM Local 1285 prevailed in court, ultimately having the TRO lifted, doubling the amount of picketers at the current site while placing no limits at all other locations, while allowing picket lines to be established at all gates. The judge presiding over the hearing also said she had driven by during the demonstration, and added that she believed the way to the way to build community support for your cause is through social media, unaware that members and supporters had already begun a successful campaign on Twitter and Facebook. Although the picket line victory is a boost to the members of Local 1285, there is still a battle at the negotiating table. The company is attacking healthcare, proposing the ability to arbitrarily change employee healthcare benefits and contributions. In 2016, the company used similar language to yank coverage from spouses of employees covered by another employer-provided plan. The Negotiating Committee has returned to the table on five occasions without any progress on the issue. Gradall has requested, and Local 1285 has agreed to return to the table Friday, March 30.